The relying party website has now been developed and tested in a development environment. 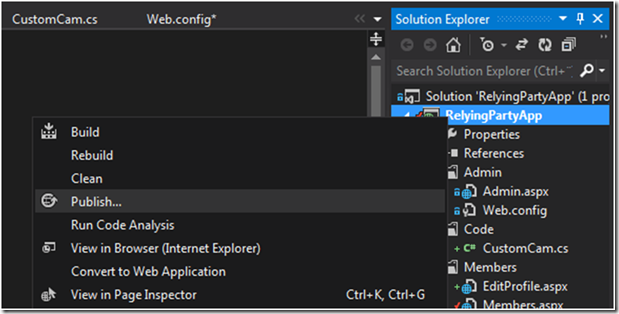 The next stage is to deploy the application to Windows Azure Websites so that users can access it over the internet. 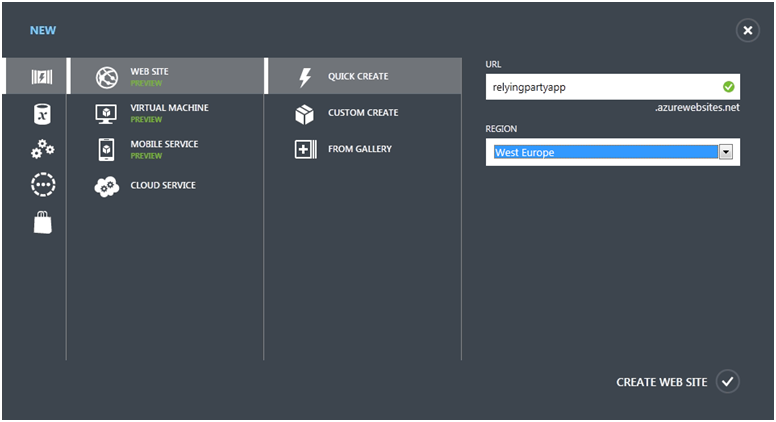 The use of the universal profile provider and a Windows Azure SQL Database as a store for the profile information means that no changes in the database or configuration will be required when migrating the application. 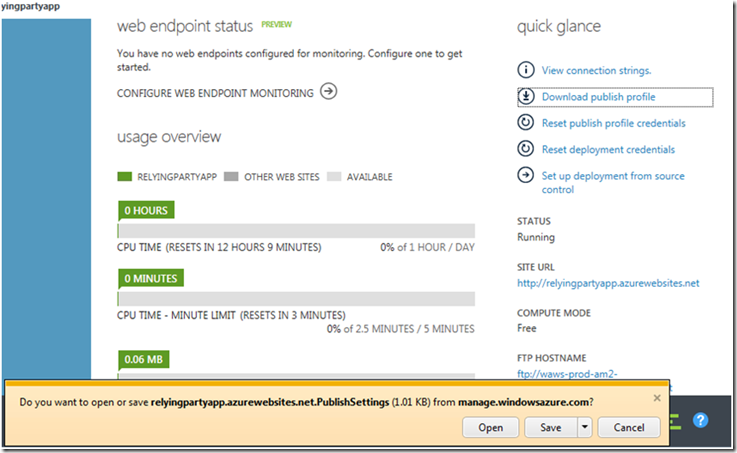 The first step is to create a Windows Azure Website in the Azure management portal. 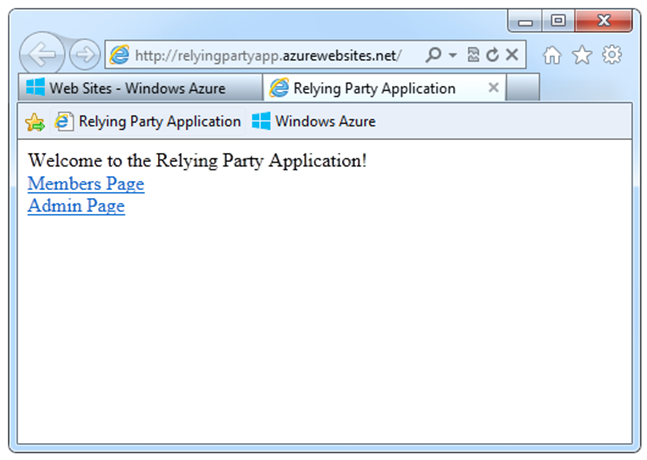 The following screenshot shows the creation of a new website with the URL of relyingpartyapp.azurewebsites.net in the West Europe region. Note that the URL of the website must be unique globally, so if you are working through this solution, you will probably have to choose a different URL. 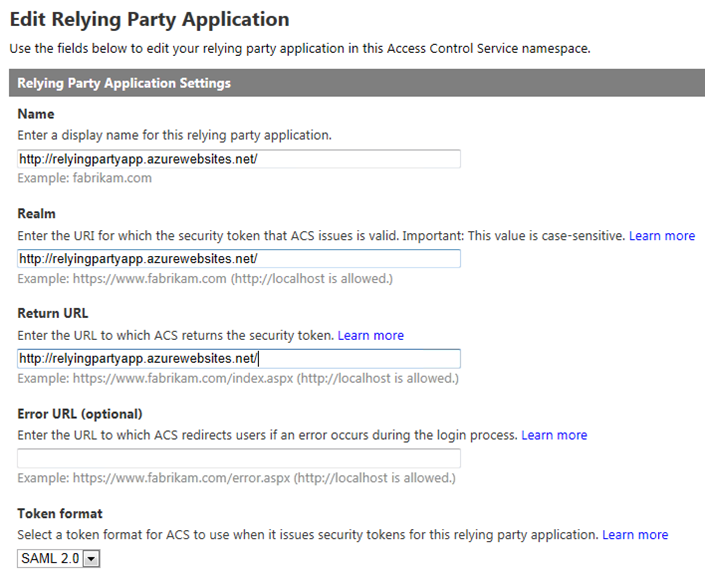 With the website created, the relying party information will have to be configured for Windows Azure Active Directory Access Control, formally known as Windows Azure Access Control Service, (ACS). 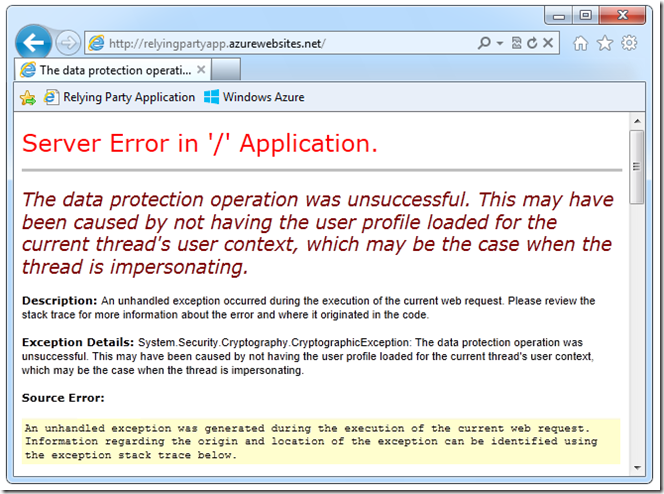 This is because the relying party configuration is specific to the URL of the website. 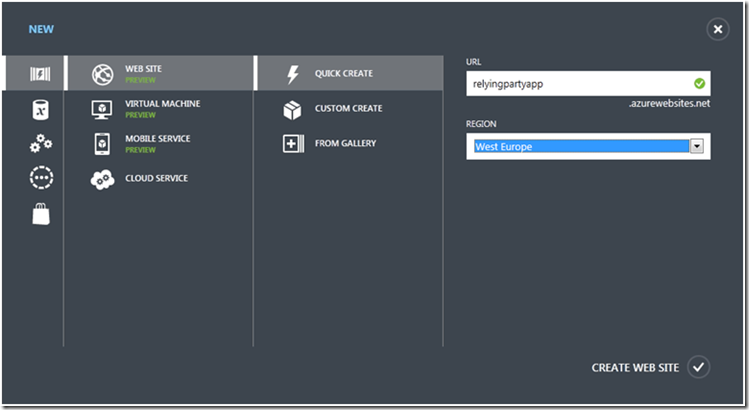 One option here is to create a new relying party with the URL of the Windows Azure Website, which will allow the testing of the op-premise application as well as the Azure hosted website. This will require the existing identity providers and rules to be recreated and edited for the new application. A quicker option is to modify the existing configuration, which is what I will do here. 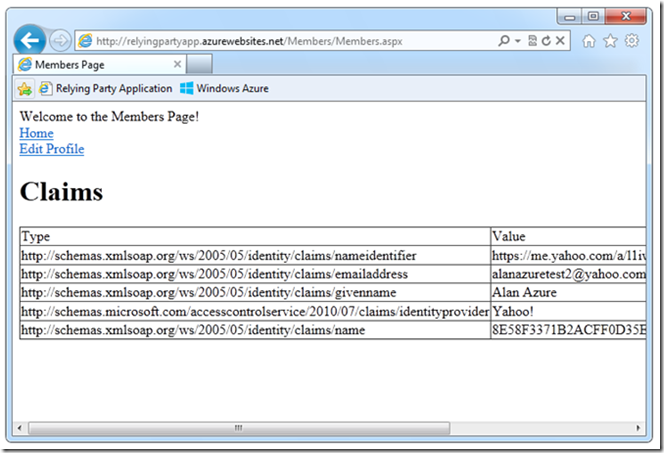 The existing relying party application is present in the relying party applications section of the ACS portal. 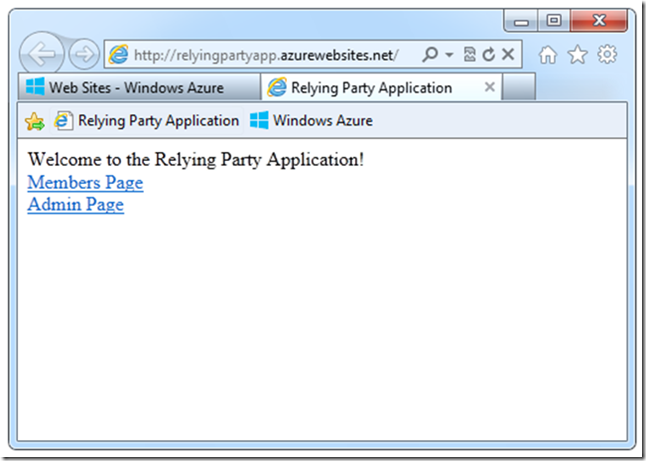 In order to change the configuration for the host application the name, realm and return URL values will be changed to the URL of the Windows Azure Website URL (http://relyingpartyapp.azurewebsites.net/). The screenshot below shows these changes. 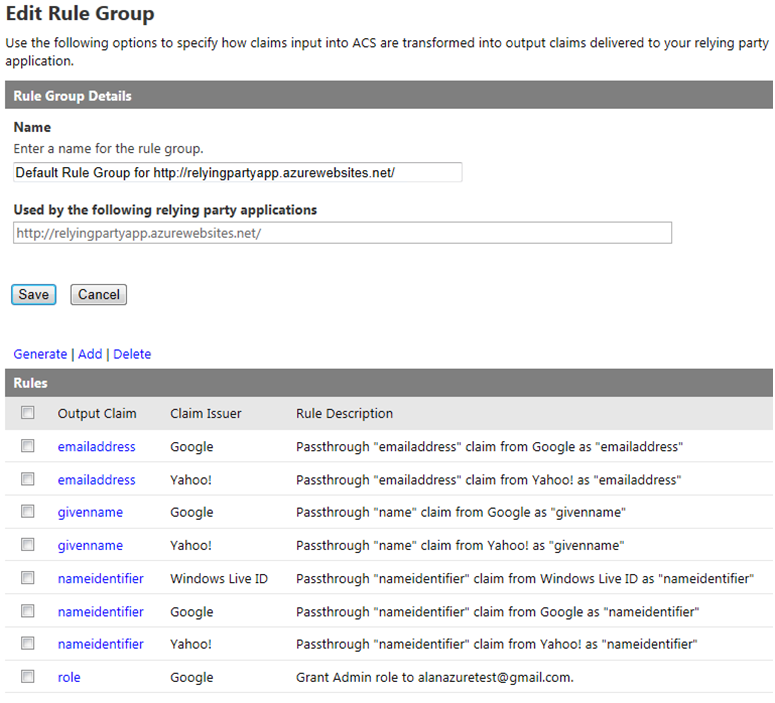 For consistency, the name of the rule group will also be changed appropriately. 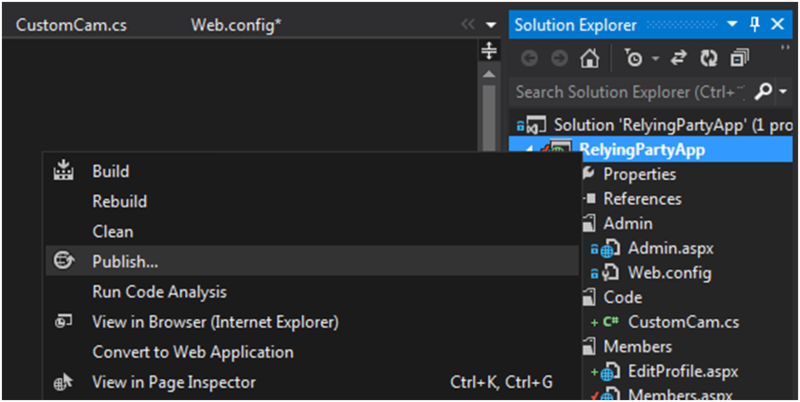 With these changes made, ACS will now function for the application when it is hosted in Windows Azure Websites. 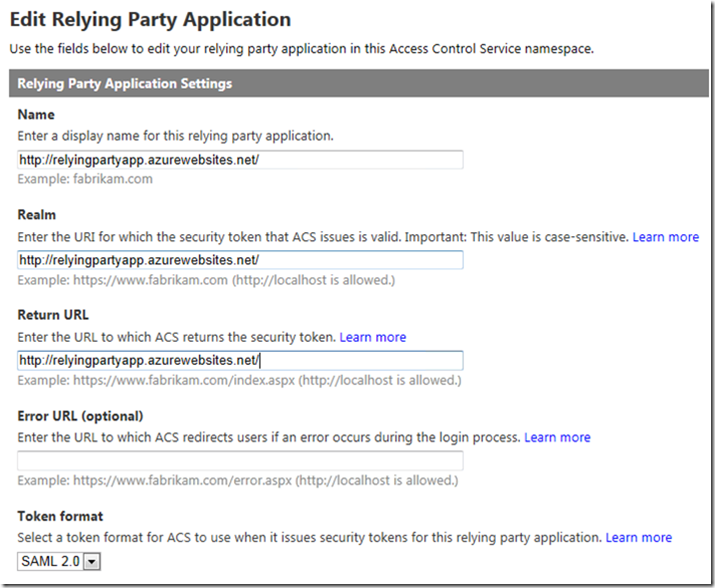 For the relying party application website to integrate correctly with ACS, the URL for the website will need to be updated in two places in the web.config file. The following code highlights where the changes are made. 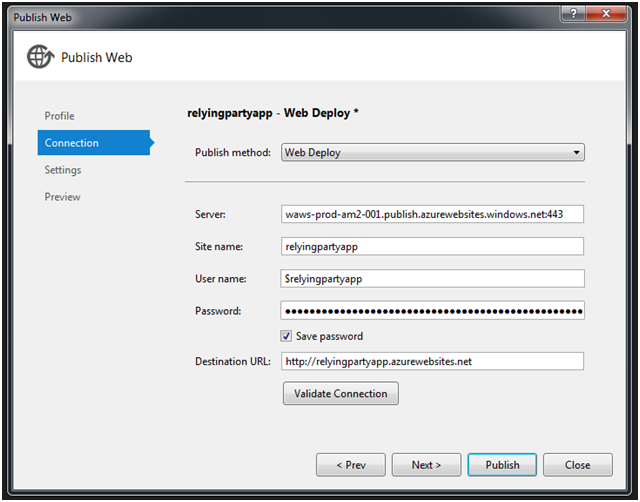 The next stage is to deploy the relying party application can be deployed to Windows Azure Websites. 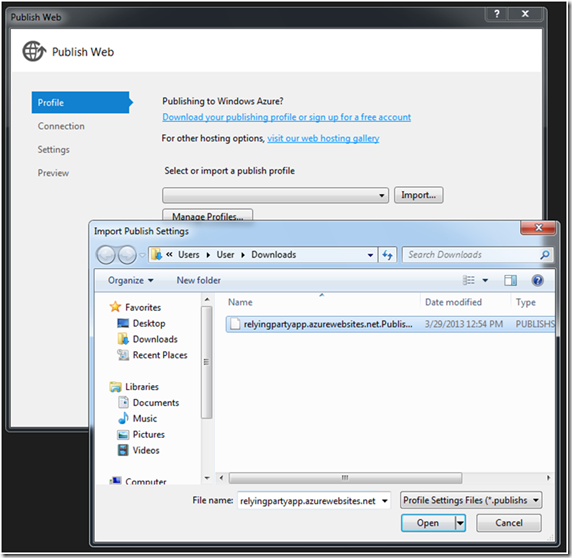 Clicking the download publish profile link will allow a publish profile for the website to be saved locally, this can then be used by Visual Studio to deploy the website to Windows Azure Websites. Be aware that the publish profile contains the credential information required to deploy the website, this information is sensitive, so adequate precautions must be taken to ensure it stays confidential. 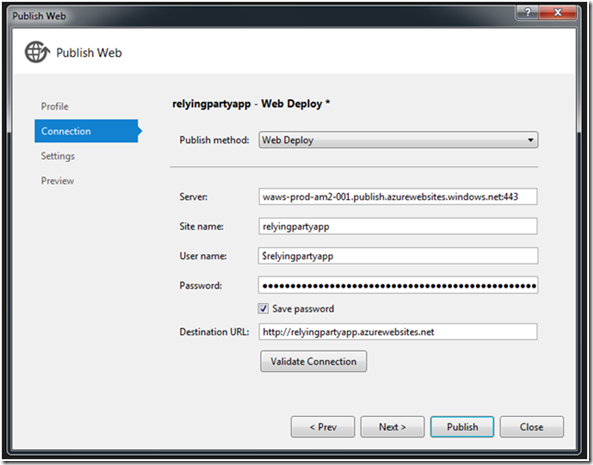 To publish the relying party application from Visual Studio, right-click on the RelyingPartyApp project, and select Publish. Clicking the Import button will allow the publish profile that was downloaded form the Azure management portal to be selected. 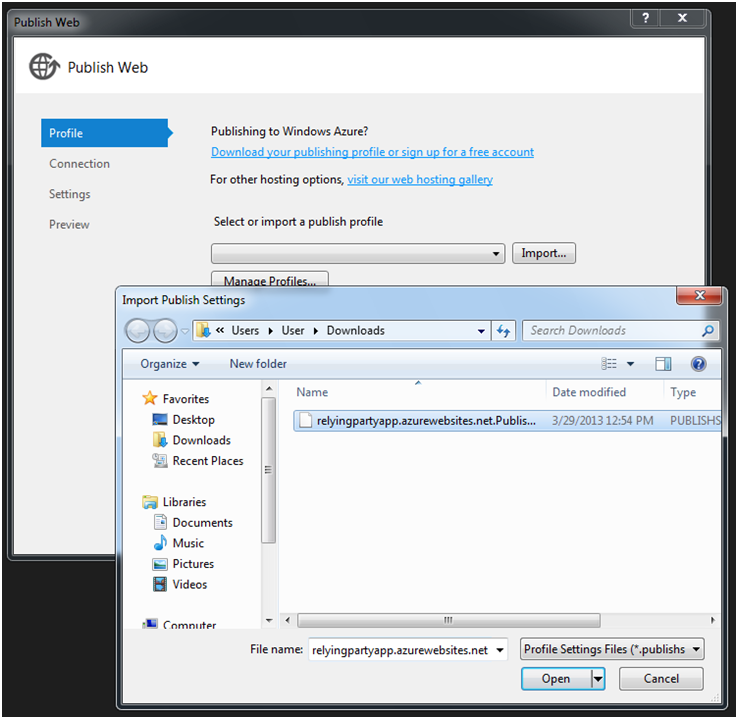 When the publish profile is imported, the details will be shown in the dialog, and the website can be published. 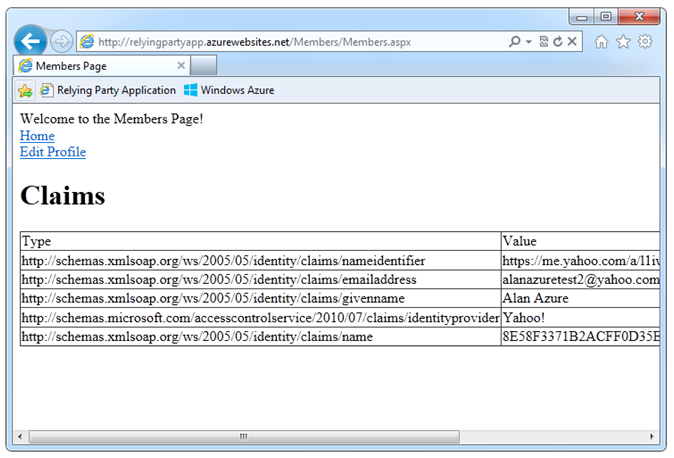 After publication the browser will open, and the default page of the relying party application will be displayed. 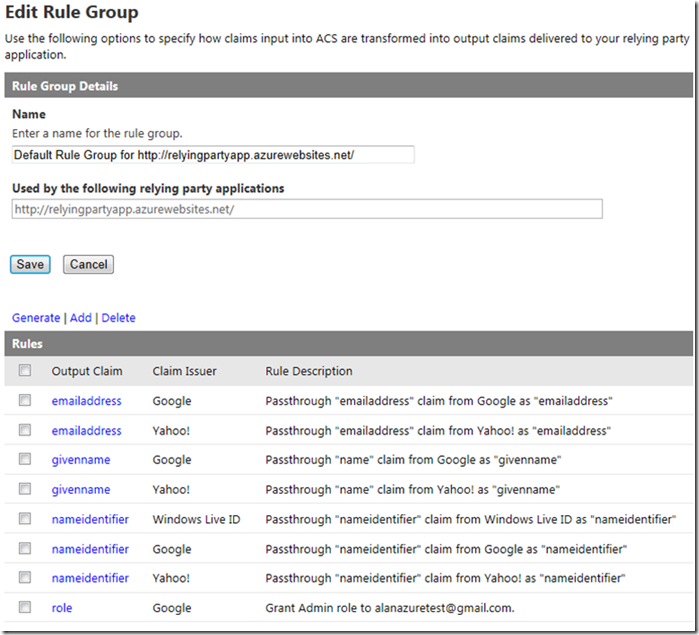 In order to verify that the application integrates correctly with ACS, the login functionality will be tested by clicking on the member’s page link, and logging on with a Yahoo account. When this is done, the authentication process takes place successfully, however when ACS routes the browser back to the relying party application with the security token, the following error is displayed. Note that I have configured the website to turn off custom errors. The next section will explain why the error is occurring, and now the relying party application can be configured to resolve the error. 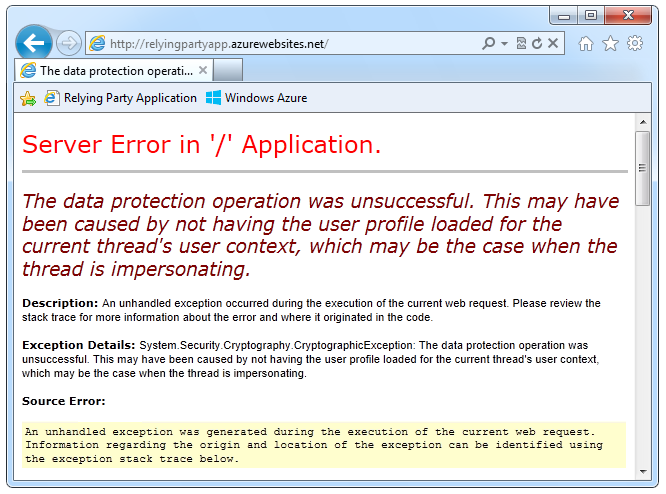 The default SessionSecurityTokenHandler used by WIF to create a secure cookie is not supported in Windows Azure Websites. The resolution for this is to configure the MachineKeySessionSecurityTokenHandler to be used instead. This is configured in the identityConfiguration section of the system.identityModel configuration for the website as shown below. With those changes made, the website can be deployed, and the authentication functionally tested again. This time the authentication works correctly, the browser is redirected to the members page and the claims in the security token displayed.